We needed some inexpensive adequate quality bed skirts to stage a home so we can put it on the market, and these bed skirts did the job. Thanks Overstock! Superior proudly introduces affordable beautifully made microfiber bed skirts available in a variety of sizes and wide assortment of soft to bold solid colors. Popular microfiber fabric ensures softness and wrinkle resistance. Brushed microfiber provides a smooth soft look, and the beautiful infinity embroidery on coordinating sheets and pillow shams make a perfect subtle accent. Match with available sheet, duvet cover, and pillowcase sets for a fantastic put together look that will make it incredibly hard to get out of bed in the morning. These brushed microfiber bed skirts are softer than Jersey Cotton and less expensive. Bed skirts come in a gorgeous array of colors and are available in king, queen, and twin XL sizes. Silky soft bed skirts, sheets, pillowcases and duvet cover sets are sure to become household favorites. Great bed skirt and the colors are beautiful. It matches my quilt set perfectly. The fabric is nice and soft and I like that is machine washable. I ordered this bedskirt along with matching pillowcases. The color is a very pleasing warm grey which was exactly the same as the pillowcases. The material and the construction were ad square for the price. The one drawback and the reason for ordering this bedskirt, was the description stated it had a 15 inch drop. It only has a drop of 14 inches. Displeased with that, but not enough to send it back. The material this bed skirt is very nice. My only complaint is that it is too wide for out king bed. It hangs over on one side. We've been able to tuck it in a little and it looks fine. I can’t begin to tell you how much I have enjoyed this bed skirt it is beautiful on. My bed I love it because it does not wrinkle it hangs so beautiful and the color is wounderful i think you would enjoy having this bed skirt I would gladly give a five star rating. Love the color and the 15 inch drop. Perfect fit. One from floor. You need pins if your mattress moves. If not it slides too much. I was very happy with the quality of the bedskirt. The delivery was extremely fast. I was happy with the feel of the bedskirt and it fit perfectly on my guest queen size bed. I did have to iron it before I put it on the bed because it was wrinkly. Love the look it gives the bed nice soft and elegant. This bed skirt was of great quality and exact in color. The color was perfect. The wrinkles came out by placing bed skirt in dryer. It fit perfectly on our king size bed. I really like shopping at Wayfair. Product arrived within a day. Amazing. Item is very disappointing - material is very thin and wrinkles easily. Not what I expected, which was disappointing. Love it! Perfect match with my /Amraupur-Overseas-Agnes quilt . Definitely recommend! Very happy with this purchase. Nicely tailored look and a perfect fit—it doesn’t hang or slide over the sides of the box springs. Good purchase! Very nice! I love the color! I ordered this in light blue, but the color was actually more gray. I love the color of blue I purchased in this bedskirt. It was true to the color pictured and goes perfectly with my comforter and pillows. The bonus is how very wrinkle resistant it is! I'd recommend this bedskirt to anyone who enjoys quality. bed skirt is fine, nothing special. "Is the platform fabric the same color as the sides?" I have a white one, so yes. I am certain the platform fabric will be white with all others. "Is this 3-sided or 4-sided?" 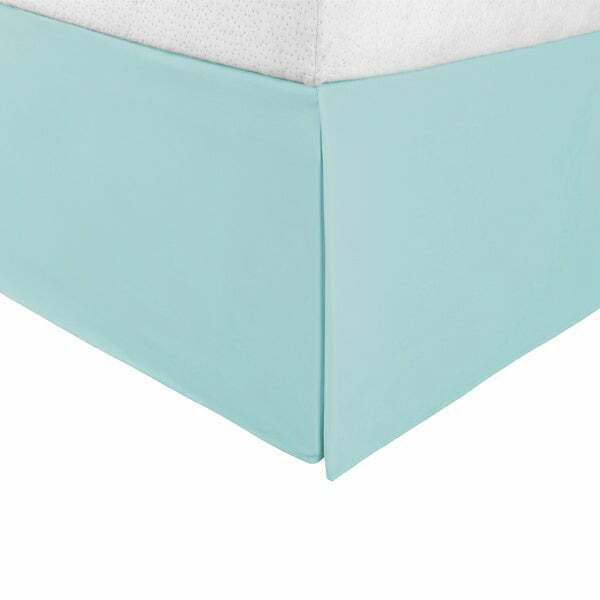 The Superior Infinity Wrinkle Resistant Bed Skirt is three sided. This bed skirt is 4 sided .. Out of town right now but I am pretty sure it is! Is this bed skirt a wrap around or do you have to take mattress of to put it on. ?